Used extensively in Australia for wet pour rubber surface applications, Safety Surfaces’ CSBR pre-coloured rubber fully complies with AS4422:1996 standards to ensure your playground surface is compliant. 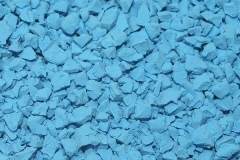 CSBR is manufactured using 1-4mm or 1-2mm granules as standard and is available in 18 different standard colours in 1-4mm. 9 different standard colours in 1-2mm are available to suit your requirements. CSBR can be manufactured in up to 9 tonne batches so jobs up to approximately 900m² can be installed from the one batch. Also available is our Carnivale range of multicoloured blends which can be viewed on our website. 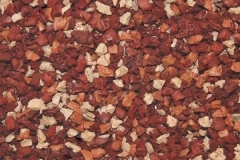 Carnivãle Colour Fusion mixes are pre-blended combinations of different types of rubber granules, providing effective and easy multicolour options. The Carnivale blends consists of three ranges; Berry, Vista and Shade. Berry mixes are made up of Opal EPDM and CSBR, Vista mixes are all CSBR, and Shade mixes are CSBR and black SBR. Carnivãle colours are like no other, being the only factory colour blend available, and providing colour consistenency with up to approximately 900m² batches possible. Used extensively in Australia for wet pour rubber surface applications, Safety Surfaces' Cova Rubba is available in both CSBR and EPDM and can be laid directly over existing concrete or pavers, even if slightly damaged. It is great for pathways, patios and verandahs. Cova Rubber is strong enough to support outdoor furniture, buggies and wheelchairs. 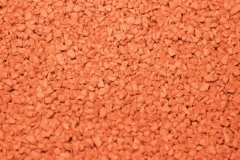 Cova Rubba CSBR is manufactured using 1-2mm granules as standard and it comes in 9 different standard colours and available to suit your requirements. Cova Rubba CSBR is manufactured in up to 9 tonne batches so jobs up to approximately 900m² can be installed from the one batch. Cova Rubba OPAL EPDM comes in 0.5-1.5mm granules and it comes in 5 standard colours and 4 UV Bright colours. The Cova Rubba system is specified for use with Hardcure binder. Hardcure has been specially formulated to give the firmer properties which are required for use with outdoor furniture, wheelchairs, mobility scooters, walkers, golf buggies and the cure times are set for the best range of atmospheric conditions during installation. Opal EPDM (Ethylene-Propylene-Diene-Monomer) is a brightly coloured synthetic rubber which is granulated for use in wet pour rubber surfacing applications such as playgrounds. Opal EPDM rubber is cast into slabs then processed through a granulating and grading plant which sizes the product and removes the granulation dust under 0.5mm. Opal EPDM has characteristics of high elasticity and resilient performance. The pigments used in the Opal EPDM compound were selected to provide a wide range of colours. Results for accelerated UV resistance are available on request. UV Brights are a premium version with even more UV resistance for problem colours. Opal EPDM is available in 1-4mm and 0.5-1.5mm granule sizes. Traqua is the latest innovation in wet area rubber surfacing specifically designed for poolside, patios, splash parks and water parks or wherever a wet/dry outdoor protective surface is required. Traqua is an intricate, close knit network of small EPDM granules that form a durable, less porous surface than conventional rubber wet pour and is applied directly onto prepared concrete sub-bases. Traqua can be applied in a thinner 10mm layer as opposed to the usual 15mm or 20mm playground surfaces, reducing cost while still retaining an impact absorbing, non-slip surface. Traqua is available in several light pastel colours which enables the surface area to remain at its lowest temperature possible to accommodate bare feet and gives a bright, attractive, modern finish. A specially developed range of bright UV resistant candy colours for features and cut-ins are also available. 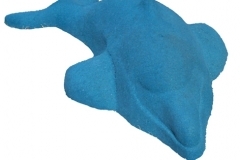 Get creative with playground designs, using a range of over 20 rubber animals and shapes. Playform provides unparalleled playground safety, with low fall heights and great impact absorbing capability. All Playform items are available in our standard range of colours: Earth Red, Grey, Light & Dark Green, Blue & Sand Yellow.